CPH Skopje registered an epidemic in the territory of the settlement Radishani, municipality of Butel with 7 measles cases in December. Due to the occurrence of an increased number of sick people from different parts of the city of Skopje during the 52nd week of 2018, on 02.01.2019, CPH Skopje reported an epidemic in the territory of the city of Skopje. 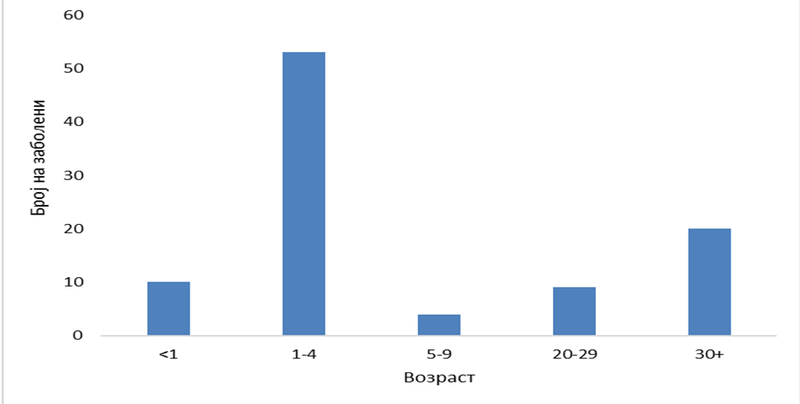 Here is measles epidemic on the territory of the city of Skopje, including the 7 cases of Radishani in 2018. As of 25.01.2019, 106 suspected measles cases have been reported in the epidemic. After epidemiological research and laboratory results, 97 were classified as measles. The epidemic started with reported cases of measles in children attending the same preschool institution “Tashko Karadzha” in the settlement Radishani, the municipality of Butel. 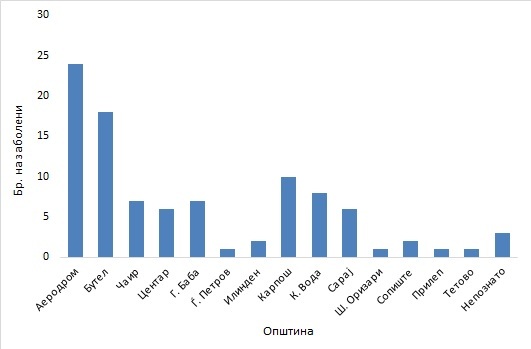 The epidemic has spread to the territory of all municipalities of the city of Skopje, so far (24.7%) of cases have been registered by the Municipality of Aerodrom (Chart 1). * The two registered cases from Prilep and Tetovo are epidemiologically related to those affected by the epidemic. 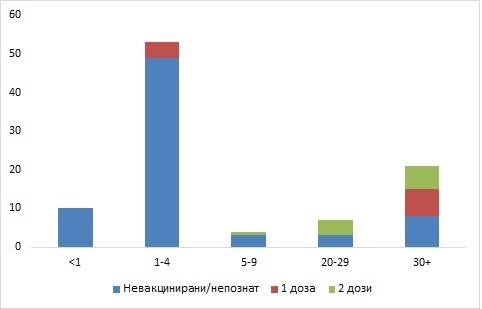 The age of the patients varies from 1 month to 43 years (median – 3 years). The number and percentage of patients (n = 53; 54.6%) belong to the age group of 1-4 years, ten children are up to one year old. In the age group above 30 years, 20 persons or 20.6% were diagnosed (Chart 2). Regarding gender, 50 cases or 51.5 % are male. The first case has been reported in 49 week in 2018, and an increase in the number of cases has been reported since 52 week in 2018. During the first week of 2019, measles symptoms occurred in 12 cases, with the largest number of cases being recorded during the second week – 31 cases. According to the vaccine status, 73 or 76.8% of diseased persons are unvaccinated (63) or with unknown vaccine status (10). From non-vaccinated children , 10 children are under 12 months of age and are not subject to vaccination, according to the Immunization Calendar (Chart 4). In terms of hospitalization, 59 cases or 60.8% of the patients were hospitalized at the Clinic for Infectious Diseases and Febrile Conditions in Skopje, of which 81.3% were aged 0-4 years. In 22 (22.7%) of the patients complications were registered, of which 15 or 68.2% of them were in children up to 4 years. From the total number of patients (n = 97), 64 or 66% were laboratory confirmed in the Laboratory for Virology and Molecular Diagnostics in IPH, 20 or 20.6% are epidemiologically related, while 13 cases are only with a clinical manifestation of measles. After proclaiming an epidemic on the territory of the city of Skopje, teams of CPH Skopje and the Health Center- Skopje inspected all vaccination points. According to the latest data submitted by the Health Center – Skopje, it was found that out of 41,189 children aged 1-5 years, 12,437 or 30% were unvaccinated. During the third week of 2019, 896 children under the age of 5 were vaccinated. From the 63,815 school children aged up to 14 years in the city of Skopje, 3,924 children have been unvaccinated. The largest number of unvaccinated children are from the first grade, ie 1,532 or 20% of the children. During the third week of 2019, 176 children aged 6-14 years were vaccinated. A total of 3793 children have been vaccinated from the beginning of the epidemic in Radishani, until 25.01.2019. From the 116923 preschool children missing from CPH Centers, 19494 or 16.7%. During the third week of 2019, 1285 children were vaccinated. The total number of vaccinated pre-school children in 2019, 2427. From the 181816 school children with to two doses of MRP vaccine, only 2937 (1.6%) were not vaccinated with no single dose of MRP, and 4064 (2.2%) were vaccinated with only one dose of MRP. During the third week of 2019, 16 children were vaccinated with a first dose and 403 with the second dose of MRP vaccine. The total number of vaccinated schoolchildren in 2019, 675. In pre-school institutions on the territory of Skopje not to accept children who are not immunized with MRP vaccine during the epidemic of measles and SSHI will control the implementation of this measure. Keep a regular record of the number of vaccinated individuals from the eligible MRP vaccine (unvaccinated and incomplete vaccinated) and to inform the CPH / IPH on a weekly basis. For all novelties and the current situation, IPH will provide information on a weekly basis (every Friday) to all /relevant institutions. 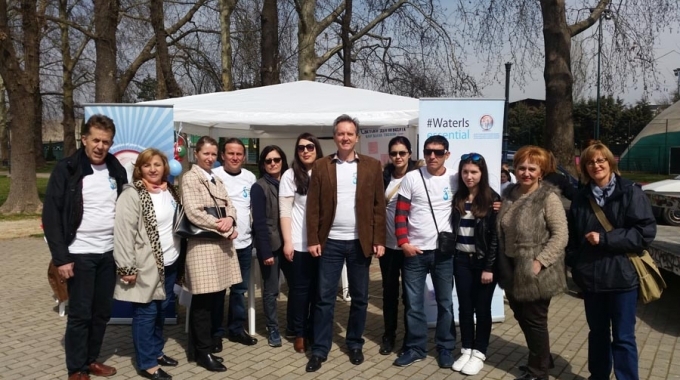 World Water Day 2015 – Without water there is no sustainable development!